In a major development being described as a brutal blow to free speech, RT — the Russian outlet formerly known as Russia Today — has now found its bank accounts allegedly blocked by the U.K. According to RT, Russian Foreign Ministry spokesperson Maria Zakharova said London abandoned any obligations to free speech when it moved to exit the European Union, as clearly evidenced in the inexplicable move by The National Westminster Bank. “RT has received a letter from Natwest, part of the Royal Bank of Scotland Group, which has a significant shareholding by the UK government, informing it that its UK banking facilities with the bank will be withdrawn without explanation or redress. “The decision is incomprehensible, and without warning. It is however, not at odds with the countless measures that have been undertaken in the UK and Europe over the last few years to ostracize, shout down, or downright impede the work of RT. Given the secretive nature of the sudden termination, speculation naturally must include RT’s function as a state-run media agency — and the worsening situations between the West and Russia in Syria, Yemen, and elsewhere — particularly, as RT notes, the U.K.’s ‘significant shareholding in NatWest. Perhaps the baffling move would not be as suspect were it not for another apparent act of extreme censorship which began to unfold yesterday evening. Prior to this accusation, Wikileaks had tweeted a string of three tweets appearing to reference its ongoing October Surprise document leaks — including cryptic codes naming U.S. Secretary of State John Kerry, Ecuador, and the U.K.’s Foreign & Commonwealth Office — in turn setting off alarm bells by those concerned the tweets indicated Assange’s ‘dead man’s switch’ had been triggered. Although neither the cutting of Assange’s Internet access nor that a state agent was responsible have been proven, if factual, speaks to the power wielded in the government transparency Wikileaks continues to provide when, for instance, President Obama’s administration has failed. 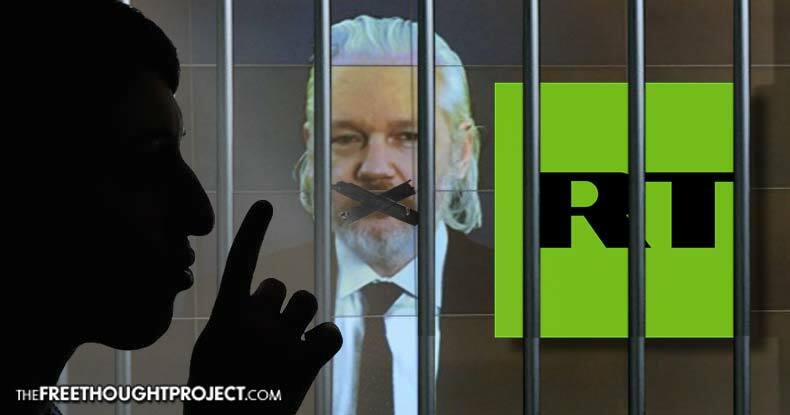 Wikileaks assumedly already has possession of whatever documents Assange might have obtained and plans to release in the future, but the attempt to silence the controversial and vociferously debated public figure are at least concerning — and at worst disturbingly indicative of the trouble an unknown will go to silence free speech and press. Attempting to gag RT — no matter its Russian state association — also presents a troubling aspect about increasingly limited and denigrated press freedom. Publisher Marcus Papadopoulos echoed that surprise, as well as concern for what amounts to abrupt censure. “I sincerely hope that there’s no political motive for this, because we know that the British government isn’t happy with RT in Britain,” Papadopoulos asserted to RT. Russia, currently home to asylum-seeker and controversial whistleblower Edward Snowden, might indeed face additional sanctions by the United States and U.K. if American politicians infuriated over a false narrative of Russian aggression in Syria and elsewhere have their way. However, as Zero Hedge pointed out, with both RBS and thus NatWest essentially acting as ‘wards of the state,’ such a politically-significant mover surely had prior clearance from the government. As the already-chilled diplomacy between the West and Russia continues to deteriorate, an announcement from White House spokesman Josh Earnest said Obama is considering a response proportional to alleged Russian state hacking into the Democratic National Committee servers — despite the lack of unassailable evidence backing that claim. Whether or not any state agent — of the U.S., the U.K., or Russia — is responsible for any of these events might never be known. But the circumstances and timing are worthy of consideration.